Leaves: Basal, narrow, linear, 20 to 40 inches long, .4 to 1.2 inches wide, smooth; tip pointed. Inflorescences: Umbel, corymb-like, irregular, several flowered. Flowers: Broadly bell-shaped to funnel-like, to 4 inches across, orange with yellowish center; perianth segments 6; lobes 5.4 to 4 inches long, spreading or somewhat curved back; tube to 1.6 inch long; stamens 6; anthers turned inward; stigma small, style exceeding anthers. Habitat: Roadsides, stream banks, edges of woods, pastures, abandoned farm sites. Origin: Native to Europe and Asia. An introduced plant that escaped from cultivation. Uses: Sometimes cooked or eaten in salads, but may be toxic. Comments: Hemerocallis is from the Greek words meaning "beautiful" and "day". 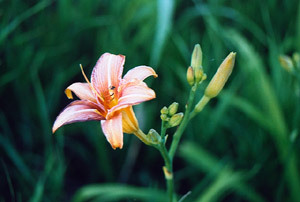 The flowers only open for a short time giving it the common name "daylily".